The recently popular Saratli Kirkgoz Underground city is 50 km away from Nevşehir and only 22 km from Aksaray. Three layers of Saratli Kirkgoz Underground City was cleared and opened for visitors in 2001. In addition to toilets, bathrooms, storage rooms and a total of 40 rooms, unlike the other underground cities in Cappadocia, the city has a ventilation system. It is believed that the city has seven layers. With the sliding security gates made of millstones, which outsiders cannot recognize as gates, Saratli Kirkgoz underground city is drawing more attantion each day. Saratli was e major settlement during the Roman Period. 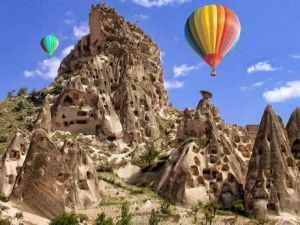 Early Christians had sought refuge in Cappadocia to escape from Roman opperssion and had built the underground cities to protect themselves from wars. In Saratli they would sustain their community until the danger was gone, sometimes a week, sometimes a month later. Water was obtained from the wells and cisterns and bread was collectively made in the city. While illumination was provided by oil lamps, oxygen intake would be through ventilation chimneys. At the entrance of the city there is an area that was used as stable with 14 mangers for straw. In a connected second area 7 mangers were discovered. On the second floor accessed by tunnels, there is a water well with a depth of 10 m. In addition to a ventilation chimney above the water well, an oven is dug into the floor next to the well. In the areas connected to this, there are 3 rooms and tunnels leading in different directions from these were left uncompleted. As one proceeds from the 2nd floor to the 3rd area in which there is a water well known as Kuyulu Dam is accessed through a tunnel. There is one room to the right of the well and 2 in the left. With its landscape planning, illumination, well-preserved state, and due to its location at the entrance of Cappadocia and on the Silk Road, Saratli Kirkgoz Undergorund City is now a favorite of tourists coming to the region. On some days the city becomes packed with tourists when several tour busses arrive at the same time, Therefore the second underground city in Saratli, namely St. Mercurius provides a good alternative. Of 7 layers of the underground city, 3 have been cleared for touristic use. The entrance is through a Seljuk period inn, known as Develik among the local people. Access to other layers is through corridors and chambers, while all passageways lead to the church. Altough the churches in underground cities are usually small , the church here is about the size of a cathedral. In the church, there is a separate chamber accommodation the graves of some children and adults. The church was used as a church until late periods. There are graves in the church. During the excavations in the church, about 20 graves belonging to children and adults were unearthed and most of them still had bones inside. In one of the graves, the skeletons of a male and a female were found on top of each other. There are various engravings of the cross in the church. The site was used mainly during the Eastern Roman period. Storage jars were also found in the city. In one corner of the city, there is a tomb known as Develi Chamber where local people do offerings. In the chamber next to this one, there can be seen embossed images of ducks or swans carved into the stone wall. St. Mercurius Underground City and church, togother with Saratli Kirkgoz Underground City, is one of the most popular destinations for tourists in Cappadocia. 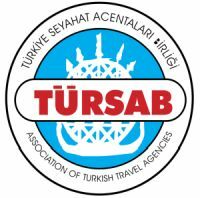 This entry was posted in Cappadocia on October 8, 2018 by Guide.